Unlocking the scientific creativity inside each person is the theme of the 2017 North Carolina Science Festival, a statewide celebration of science and technology happening this year April 7-23. The festival features several hundred simulating events, so something exciting will always be nearby. Now in its sixth year of participation, UNC Charlotte has added to (and greatly expanded) its Science and Technology Expo. The University also is offering a six-event series of kid-stimulating science and technology workshops, as well as the always-mind-blowing-late-night star party. The Science and Technology Expo remains the University’s largest North Carolina Science Festival (NCSF) event, and it is the festival’s grand finale, closing out the celebration from noon to 4 p.m., Sunday, April 23, (rain or shine) with an ever-expanding set of activities, including robotics, rocketry, virtual people, live animals, lab experiments, explosive chemistry, exotic plants, fire engines, race cars, boats and drones. The event is for the science-curious of all ages, featuring more than 100 hands-on activities and presentations in chemistry, physics, geology, computer science, engineering and biology developed by University science and technology departments and labs. The Expo, however, has grown to be much more than a showcase of UNC Charlotte expertise. Now, a host of industry and community organizations are involved in what has become a regional festival of ingenuity and education. Among this year’s partnering organizations are STEM-oriented institutions such as Discovery Place, the N.C. Zoo, Great Outdoors University (N.C. Wildlife Federation), Makerspace Charlotte, Clean Air Carolina and First Tech Challenge Robotics (100 Black Men of Charlotte). A host of K-12 schools participate as well, and with them this year will be Charlotte STEAMFest, a nonprofit organization that develops and presents STEM and arts activities developed by pre-college students. 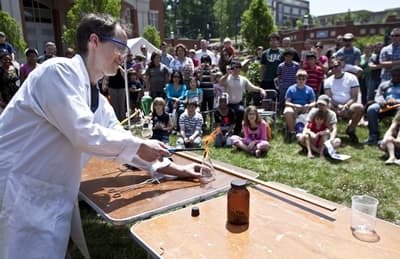 The UNC Charlotte Science and Technology Expo will be located on the quad across from the Popp Martin Student Union and adjacent to Halton Arena. The event is free and open to the public, and all campus parking is free on Sundays (the Student Union Deck is the recommended parking venue). For a sixth year, the UNC Charlotte Observatory will offer a night of expertly guided star-gazing, as it hosts its N.C. Science Festival Star Party on Friday, April 21, starting at dusk. The party offers the public the chance to use several of the University’s larger telescopes for viewing exciting celestial objects and also provides lots of other astronomy-related activities and displays for the kids. The event is free, but advance registration is required online; see the UNC Charlotte Observatory website. Because of strong popular demand, UNC Charlotte will offer an expanded series of educational workshops for children, priced at a nominal fee (or free), on topics sure to engage learning. The workshops are all designed to provide age-flexible, high teacher-student ratio learning experiences that kids and parents can have together. All workshops require advance registration. The first of these workshops “Do It Yourself Hydroponics” is on Saturday, April 8, from 9 a.m. to 3 p.m. at the UNC Charlotte McMillan Greenhouse. This workshop is designed to teach everyone from children (grades three and up) to adults the fundamentals of horticultural science and provide instruction in hydroponic technology, an advanced plant-growing technique. All participants will get to construct and bring home their own simple hydroponic garden and also receive instruction for building larger and even more sophisticated systems. Advance registration is required and space is limited – the workshop costs $5 per person (includes lunch), and all registered children must be accompanied by a co-registered adult. On Saturday, April 8, and repeated on Sunday, April 9, the William States Lee College of Engineering and the College of Computing and Informatics are jointly hosting two full-day LEGO Robotics Workshops from 9 a.m. to 4 p.m. in the labs of UNC Charlotte’s EPIC building. The learning workshop is the product of past experiments in using the LEGO Mindstorms building kits to teach introductory robotics skills. The events offer kids in grades three to 12 the opportunity to learn robotics with expert guidance in small, multi-instructor staffed, age-appropriate classes. The instruction is designed for children and an accompanying parent and costs $10 per child/parent pair to cover lunch, which is provided. Advance registration is required, and space is limited. Also on Sunday, April 9, the University will offer a special, free Bioinformatics Teacher/Student Workshop from 9 a.m. to 3 p.m. in the Bioinformatics Building. Both an introductory workshop for advanced high school students and a professional development workshop for high school science teachers, this day-long workshop is intended to be an introduction to the science and technology of the exciting, emerging field of bioinformatics, the science of collecting and analyzing large sets of genetic data. The workshop will include the option of joining a subsequent web-based course of research and study that participants can follow independently. Pre-approval is required for registration. Participating students are required to come with a teacher. Interested teachers should email James Hathaway jbhathaw@uncc.edu for more information and registration. On Saturday April 15, the workshop series will conclude with two concurrent events, each running from 9 a.m. to 3 p.m. In Woodward Hall, the College of Computing and Informatics will host a Drone Avionics Workshop, a day-long activity co-hosted and developed by Charlotte Latin School. This workshop has been developed for students in grades seven through nine to teach the principles of flight, drone programming, operation and design. Students will practice flight simulation, learn drone programming using a model system and operate a drone that they've designed. In Burson Building, the Department of Chemistry will present an interactive workshop for children ages 7 through 14 entitled “The Colors of Chemistry.” This full-day workshop is designed to be a fun introduction to the science of chemistry, as students learn about dyes, pigments and other colorful chemicals and make their own chromatic concoctions. Participants will do bright tie-dye and lather printing experiments and have the opportunity to watch exciting demonstrations while learning about atoms, molecules and polymers. Advance registration is required for both workshops, including $5 per student fee for lunch. All participants under 18 years of age must have an accompanying parent or designated adult (groups of up to three per adult permitted). Workshop registration is online. Except for the workshops, all other UNC Charlotte NC Science Festival events are free and open to the public. All events are sponsored by UNC Charlotte in association with the N.C. Science Festival. Major support is provided by University of North Carolina General Administration through a grant administered by the N.C. Science Festival and the N.C. Biotechnology Center. FMC also is an event sponsor. University sponsorship is provided by UNC Charlotte Research and Economic Development.